Valentine's Day Hugs and Kisses Gift Basket. 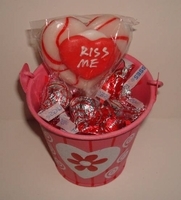 This cute Valentine's Day tin pail is filled with 6 Hershey's kisses and 6 Hershey's kisses hugs along with a heart shaped sucker with a message of love. Our hugs and kisses Valentine gift basket is perfect for teachers, co workers , adult and kids. Just to let that someone special know you are thinking of them on Valentine's day. Each tin pail is 3"h x 3 1/4"w. The design on pail and sucker varies , but are all themed for Valentine's day. Each one is in a cellophane bag and tie with a ribbon. If you would like we can even add a gift message.